What's Behind Trudeau's Secret Mosque Visit? Originally published under the title, "Liberals Mum on Trudeau's Mosque Visit." Justin Trudeau, leader of Canada's Liberal Party, speaks at a political rally on August 12. 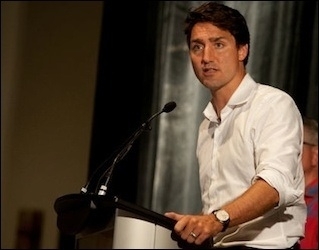 Recently, Liberal Leader Justin Trudeau met privately with a group of Islamic leaders inside a Regina mosque, an event from which the media were barred. The Liberal party is keeping a tight lid on what transpired during the two-hour, closed-door session last Tuesday. The gathering may well be one of the few election events of 2015 that will go unreported because as one correspondent assigned to cover the story told me: "Unfortunately I wasn't permitted inside." It seems almost every time Trudeau steps inside a mosque, he walks into a minefield of controversy. In March 2011 he visited a mosque in Montreal that a month later was classified by U.S. intelligence as an al-Qaida recruitment centre. Trudeau pleaded ignorance, arguing the mosque's link to al-Qaida came up only after he had visited it. In fact, as early as 2006, CBC's Radio Canada had done a lengthy investigative report on that mosque, identifying it as a well-known centre of radical anti-West rhetoric. What did Trudeau discuss with Islamic leaders behind closed doors at a Regina mosque? The Regina mosque where Trudeau held his closed-door meeting last week "recommends" the ISNA website to its members on its web page. A Liberal press release made no mention of the event. When I pressed for an explanation, a Liberal staffer in Ottawa called me saying it was not Liberal policy to make visits to religious institutions open to the media. But that's not accurate. Trudeau has been photographed praying alongside Muslims in a Surrey mosque. Next, I asked Liberal MP Ralph Goodale who had accompanied Trudeau, why the media was barred from the Regina mosque event. His answer was: "Media was present for coverage at door to mosque. Inside was regular evening prayer. Not our place to invite media." But that does not match the account by Regina's Leader-Post newspaper. It said, "The Liberal leader arrived in Regina on Tuesday evening and headed to a south-end mosque where ... the media was not permitted to attend." The reporter, Nathan Liewicki, later told me, "A (Liberal) party spokesperson said Trudeau was going to be at the mosque and that the media were not able to attend." Meanwhile, a spokesman for the mosque told me in an email Trudeau met with many members of the local Muslim community during his visit adding: "It was wrongly reported in the media that they were not allowed to attend. The coordinator from the Liberal party was asked to arrange for (a) media person if they wanted." Contrast the Liberals' secrecy with Conservative Leader Stephen Harper's visit to a Hindu temple in Toronto on Monday. It was an open event with no restrictions on the media while the Liberal one was shrouded in secrecy. Trudeau owes an explanation to Canadians. What was discussed behind closed doors with Islamic leaders inside that mosque? Tarek Fatah, a Robert J. and Abby B. Levine Fellow at the Middle East Forum, is a founder of the Muslim Canadian Congress, a columnist at the Toronto Sun, and the author of the award-winning books Chasing a Mirage: The Tragic Illusion of an Islamic State and The Jew is Not My Enemy: Unveiling the Myths that Fuel Muslim Anti-Semitism.